Recent articles have discussed the growing use of artificial sweeteners among children in the US. It seems, with the increased understanding of how harmful sugar is to our health, especially in youth, a trend towards artificial sweeteners has begun. But is it safe? Artificial sweeteners include an array of chemical concoctions including products like aspartame, acesulfame, neotame, saccharin, advantame, and sucralose, among others. The most common plant based option is stevia. What makes these artificial sweeteners so attractive, not surprisingly, is that they increase the sweetness of a food without the added carbs and calories. To many parents, this seems like an ideal alternative to real sugar, especially given all the advertisements about how these no- and low-calorie sweeteners help people lose weight and balance blood glucose levels. In some cases, the switch isn’t even known to parents. Many products tout lower sugar and calories while failing to point out the swap from real to fake sugars. Unfortunately, there are many problems with the use of artificial sweeteners in children. If you are a parent, it is imperative that you know this information. Artificial sweeteners are far from safe and may even cause lasting damage to a child’s health. Let’s run through the main concerns so you can make an educated choice on how these sweeteners are used, or not, in your family. On taste: Artificial sweeteners, when used frequently, train a child to expect very sweet foods. On the whole, artificial sweeteners can be anywhere from 180 to 20,000 times sweeter than regular table sugar! If not used in low doses, a child can easily become conditioned to overly sweet foods. 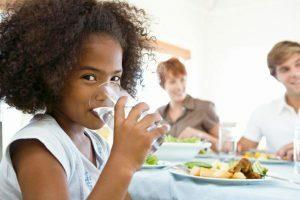 Instead of decreasing sugary foods, it may only increase them later in life when they start making food choices for themselves outside of the home. On weight: In research we see few beneficial effects of artificial sweeteners on weight. Kids, in general, are very attuned to their caloric needs. A decrease in one area usually leads to an increase in another. There are a whole host of other foods included at meals and snacks, and just cutting calories from soda or candy will not make up for a consistently unhealthy diet and lack of physical activity. Touting these lower kcal junk foods is not the answer to our obesity epidemic. On blood sugar: Artificially sweetened products are often promoted for their beneficial effect on blood sugar. By replacing the sugar, the theory is we should be able to keep our blood sugar more stable and prevent those spikes that can lead to weight gain and obesity. When consumed in small quantities and with a variety of other foods at a meal, the effects might be somewhat positive in that respect. However, when used in excess and at the expense of other more natural carbohydrate foods, the body, it seems, can be “tricked” into thinking there is glucose entering the body. In response, high levels of insulin are released to deal with this onslaught of “sugar.” This can then trigger a hypoglycemic episode where blood sugar goes too low and/or increased hunger signals are sent to get that carb hit the brain is looking for. A harmful cycle can begin in which insulin and glucose levels are not well maintained starting in childhood, and this may eventually lead to insulin resistance and an increased risk for disease, namely diabetes, later in life. On healthy diet: With this increase in artificial sweeteners comes an obvious fact. We are feeding our kids more processed foods. These processed foods are coming at the expense of natural, whole foods which contain an abundance of nutrition that our growing kids need. Starting at an early age we are teaching out kids to rely on and prefer processed foods to more natural choices. While not necessarily harmful in the short term, many of these foods are nutritionally inadequate for our youth. Even in adults we are seeing poor intake of various nutrients when processed foods comprise a large portion of the diet, and this is likely happening with our kids as well. While meaning well in most cases, many parents are setting their kids up to prefer processed foods with the consequence of potential nutrient deficiencies. These are the main reasons I strongly hesitate against the use of artificial sweeteners in the diets of our children. Apart from being unnatural, they really just aren’t necessary. They are not the answer to the problems we are seeking to solve. Instead they create risk in terms of adequate nutrient intake and even disease risk later in life. Parents, instead of resorting to artificial sweeteners, I implore you to do the hard work of teaching your kids to enjoy savory and lesser-sweet foods. It’s hard work no doubt and yes, you end up being the bad guy on many an occasion, but your kids will benefit in the long run. Better yet, start very early on if you still have the chance and set those dietary patterns from the start. Consumption of low-calorie sweeteners jumps by 200 percent in US children. The problem with sugar-free kids. If you are a parent having a tough time getting your kids to dump the sugar, I’d love to help. Get in contact with me and let’s see if we can get your family on a healthier path. It’s never too late!